First of all, sorry for hardly posting lately, I've been busy with school and other hobbies. A few weeks ago we met up with Christian Artuso for a birding outing, searching primarily for Black-backed and Three-toed Woodpeckers, and owls. We were successful and got some nice photos. We drove east towards into the Boreal Forests, where owls and the uncommon woodpeckers we were after are usually. We didn't see much until we hit the boreal forest. When we hit the boreal forest we saw a Northern Hawk owl, very cool birds! It was very far away but we got a decent look at it through Christian's spotting scope. Unfortunately we couldn't get any half decent photos at that range, so I didn't even bother having one in this post. The next notable bird we saw was a Northern Shrike, the photo is very bad because it was so far, almost as bad as the Northern Hawk Owl's, but since I've never gotten a photo of a shrike before I thought I'd include it. And the owls.. We spotted two shapes on the hydro poles ahead, and with binocular identification Christian announced there were two Great Grey Owls! It was a little unusual for the two owls to be right beside each other so we thought they might be a pair. Now it was time to get down to searching for Black-backed and Three-toed Woodpeckers. 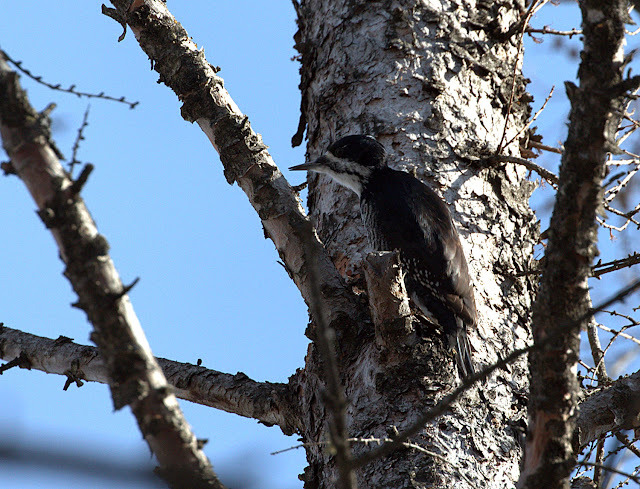 The method is to drive slowly along the road and look for scaling (stripped bark off of trees by these woodpeckers). If we saw significant amounts of scaling we stepped out of the vehicle and turned it off and listened for several minutes (maybe some of us walking out in front of the vehicle and some behind). 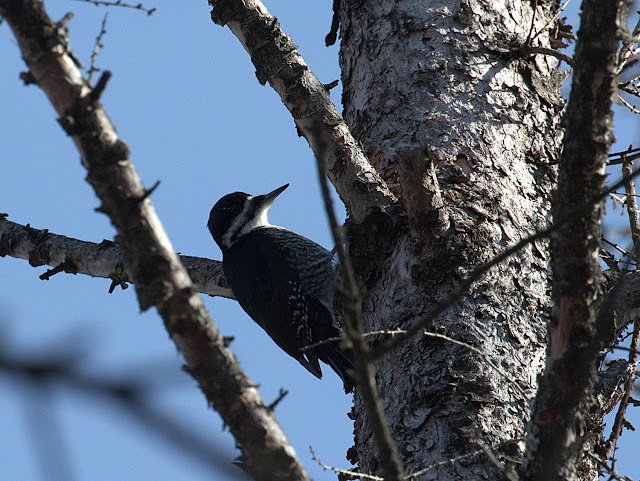 We were listened for tapping, Black-backed Woodpecker tapping on trees. Then if we heard tapping we would go into the forest and search it out and photograph it. We did that over and over again (they're not common woodpeckers) and we saw some other birds along the way, including Grey Jays. Finally after a long while of stopping and listening we heard something.. Tapping! We plunged into the deep snow of the forest and got my boots full of snow. Finally we found the woodpecker... A downy? Yes, a Downy Woodpecker. A bit of a disappointment but we kept trying, and we were rewarded. A Black-backed Woodpecker! A lifer! It was rather high in the trees so the pictures are the greatest, but they're still quite good. We ended up seeing several of these woodpeckers, no Three-toed but I'm not disappointed, one is enough to be expected. After pushing am intoxicated driver that was backing up in the middle of nowhere on an isolated country road out of the ditch we headed to Elma to check at the feeders there for any birds. And there were some birds, but it was a sad sight. There was a flock of Evening Grosbeaks at some feeders, but almost everyone had eye disease. There eyes were looking in very bad condition and some were crusted over entirely. They seemed quite blind as we could walk up pretty close to them. We knocked on the house's door and advised the owner to clean the feeders and not put them up for several weeks to try and stop the eye disease. Evening Grosbeak with eye disease. No ducks at the dam but some really amazing ice formations which I think was worth it. Thanks for reading, and thank you Christian for spending the time with us!! So most of the snow melted but now it all came back! Okay, not all of it, but we had a snowstorm and there's a lot on the ground. There is actually water and slush under most of the snow, and it should melt soon, but snow is coating everything. It stuck to all the trees looks very beautiful and it is exactly like what happened last year (Birding in a Winter Wonderland). First of all here are some pictures of the snow. Now some birds. There were a bunch of juncos flitting about in the snow bushes and some American Tree Sparrows! The first of the year for me. That's when I went back to the house to get the telephoto lens. And of course, there are always Black-capped Chickadees everywhere. Here our dog Winzy is standing in the exact same spot as the post from last year about the snow like this (mentioned above). And it's come fast! In less than a week most of the snow has melted, the ditches are full of water, and geese have come back. I've seen some robins, juncos, Bald Eagles. We went birding the other day with Christian Artuso and saw Black-backed Woodpeckers and some owls. I should get a post out soon. I've missed quite a few lately, but here is another one.